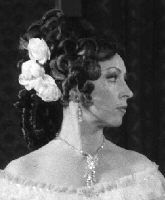 The soprano, Rumania Bareva, was born in 1945 in Sofia. She graduated from the State Academy of Music as a student of Tzvetana Dyakovich. While studying at the Music Academy she was a soloist with the Symphony Orchestra of the Bulgarian Radio and the "Sofia Soloists" chamber ensemble. She was a prizewinner in the Fourth International "Prague Spring" Competition and the Fifth Bulgarian Competition for Young Opera Singers and Instrumentalists. In addition to singing with the Sofia National Opera she has guest appeared in Hungary, Czechoslovakia, GDR, FGR, Austria, Italy, France, Norway and Finland. Major roles in her career included Mimi, Liu, Butterfly, Gilda, Violetta, Adina, Fiordiligi, Pamina, Susanna, Zerlina, Tatyana and Margarita in both Gounod's and Boito's operas. She has been equally successful on the concert stage.